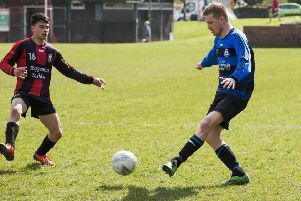 Denholme United’s winning start to the season in Division One of the Halifax AFL was ended in their eighth outing at home to Elland Allstars. The Foster Park visitors won 4-3 with the help of two goals from Will Chappell. Illingworth St Mary’s Reserves took advantage of Denholme’s defeat to close the gap at the top to just three points with a 6-1 victory over neighbours Crossley’s. Saints started strongly and soon went ahead when youngster Morgan Eastwood reacted quickest in the box to score against his former team. Another ex-Crossley’s player, Bailey Naylor, was next on the scoresheet and he scored three excellent first half goals to take his tally to 13 for the season. Crossley’s rallied in the second half and Saints were again thankful to have Tony Clarke in goal. Fine strikes by Ronnie Barlow and Robbie Sinclair made it 6-0 before James Broadbent rewarded the home side’s efforts. Brighouse Sports are third but were made to work hard for a 1-0 home win over next-to-bottom Calder ‘76 Reserves. The Salem versus Ryburn United Reserves game and the Shelf United Reserves versus St Columbas contest in the section below were called off because there was no referee. FC Plummet Line stayed at the top of Division Two with a convincing 6-0 victory away to Midgley Reserves. By recent standards, it took them some time to get going and the midfield battle was very hard fought and competitive with Plummet’s Phil Bailey and Midgley’s Andrew Yates in the thick of it. Plummet drew first blood when Josh Hunt directed a header over the keeper into the top corner from 15 yards following a lovely floated ball from Rhys Carrington. The second followed soon after as Bailey struck a fantastic shot over the keeper from the edge of the area. Plummet were now starting to get into gear and the third and fourth followed just before half-time thanks to an own goal from a corner and Hunt’s second with an excellent low finish. Centre back Arron Ashworth scored his first ever goal for Plummet with a fine glancing header following a Tom Howse corner. Leading scorer Liam Calvert got his customary goal when Hunt unselfishly played him in and there was still time for Calvert to miss a penalty after Adam Knapton was upended by the keeper. Junction Inn are third after thumping visitors Hebden Royd Red Star 12-1 while first team captain Matthew Rushworth, on the comeback trail after injury for Northowram Reserves, scored twice in a 6-1 win away to Sowerby United Reserves. The three games in Division Three produced handsome home wins for FC Ovenden (5-0 against Brighouse Sports Reserves), Mixenden United (5-0 against Warley Rangers) and Shelf FC Reserves (6-3 against Stainland United). Mixenden are top while newcomers Shelf were getting off the mark at the sixth attempt. The line-up for the quarter finals of the Jack Haymer Challenge Cup was finalised on Saturday when Greetland won 6-3 at Holmfield and Ivy House beat visitors Copley United 5-4 in delayed second round games. Adie Ford (three) and Karl Jowett (two) did much of the damage for Greetland while Gary Ash’s two goals for Copley were in vain. Updates draw: Elland Allstars v Brighouse Sports, Ivy House v Sowerby Bridge, Midgley United v Greetland, Shelf FC v Shelf United. Matches on November 25.